Xylitol is an important functional sugar alcohol which is widely used in industries. To efficiently produce xylitol from xylose by xylose reductase in a single step, the coupled system and the coexpression system using xylose reductase (XR) from Rhizopus oryzae and glucose dehydrogenase (GDH) from Exiguobacterium sibiricum were constructed, the latter of which was used for cofactor regeneration. One hundred fifty grams/liter of xylose could be fully converted to xylitol by employing the two-enzyme coupled system with cell-free extract, and xylitol productivity of 21.2 g/L/h was reached by biotransformation in vitro. 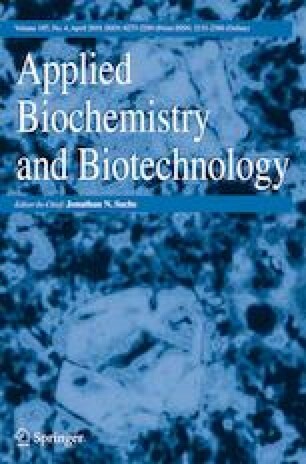 The whole-cell biocatalyst coexpressing xylose reductase and glucose dehydrogenase was successfully used to synthesize xylitol via enzymatic reduction of xylose. After optimization of the induction condition, the enzyme activity reached 1533 U/L. Two hundred grams/liter of xylose could be completely converted to xylitol, and the highest xylitol productivity of 6.37 g/L/h was obtained under the optimal transformation conditions. Thus, recombinant Escherichia coli coexpressing xylose reductase and glucose dehydrogenase is a promising candidate for xylitol production from xylose. The authors gratefully acknowledge the National Natural Science Foundation of China (No. 21602199; No. 31401527) and the Research Program of Science and Technology Department of Zhejiang Province (No. 2015C32052). The article does not contain any studies with human participants performed by any of the authors.